I’ve kept well away from the block size debate but the launch of Bitcoin XT is worth a quick mention. But I’ve been asked by several people what I think. And, at core, I think it might come down to three issues: 1) fear of two different types of failure, 2) a clash of visions and 3) no process for reconciling the first two issues. I don’t contribute, but I do read the Bitcoin Development mailing list. I find it immensely helpful in keeping up with much of the day-to-debate debate. What becomes clear when you read it is that there are (at least!) two distinct cultures at work. First, there is a very strong security engineering culture. I sometimes think the trick to being a good security engineer is to think like a software tester (and vice versa): “How could I break this?”… “How could an attacker get round this?”… “What could go wrong here?”… “How could I force the provider of this service to waste all their resources” And so on. Your job is to figure out all the ways something could fail, and fix it. So, when presented with something like an increased block size, you obviously focus on all the things that could go wrong: miners on slow connections could get out-of-sync with those on the other side, the increased cost of running a node could create a centralisation pressure and so on. And when you compare this against the potential benefits, you might not think the change makes sense: there’s an increased technical and security risk but you haven’t fixed the underlying scalability issue at the heart of the system… you have, in some ways, just kicked the can down the road. So you might say that a driving issue here is “fear of technical failure”: the change, which has uncertain benefits, could cause catastrophic harm. Better not do it just yet. But, on the other side, is a somewhat different culture, one that comes from a world where there are problems everywhere you look and they all need fixing. So you pick the biggest one, fix it and move on. The engineering functions of large companies are often like this. You know your change might cause problems but if you believe “doing nothing” is not an option then it comes down to making the least-worst decision. There are, after all, usually no good solutions, just compromises. So, if you’re faced with a problem like blocks getting full in some foreseeable timeframe, it is natural to ask yourself: what is the risk of doing nothing? If your belief is that consumers mostly have choices and will simply abandon a system that can’t guarantee transaction confirmation in a reasonable period then you’ll likely see failure to increase the block size as something that will lead to a catastrophic exodus of users and your bias will likely be towards making the change. For you, the issue is “fear of practical failure”: failing to increase the blocksize, a change which has uncertain risks in any case, will drive away users and make the system a failure in all practical cases. Where it gets more complex is when it comes to vision: if there was common agreement on what outcome was desired (e.g. “x transactions per second across the blockchain by 2017” or “the system should support this number of consumer wallets”) then the discussion would be a pure engineering discussion: “what is the best way to achieve this goal?” But it strikes me that there isn’t agreement on this underlying vision. And so, the engineering discussions get lost in the sound of people talking past each other or, worse, resorting to ad hominem arguments. If you’re arguing from different premises, you never get anywhere, sadly. It’s what makes political discussions on the internet so tedious..! In most projects, these issues can be resolved, ultimately, through the “benevolent dictator” model. Linus just decides. Unfortunately, that process just doesn’t work in a system like Bitcoin. It’s not enough to control which code goes into the “core” distribution: the prevailing network rules are a complex function of miner adoption, full node adoption, wallet adoption, major merchant/processor adoption, and more. It’s an inherently messy and political process. So the block size debate is likely to just be the first of many such controversies in this world. The launch of Bitcoin XT is an interesting way to force the debate towards a conclusion but it’s likely to be messy. And I hope those looking at “private blockchains” aren’t feeling smug as they read this. Managing the maintenance and upgrades of shared ledger systems between firms won’t be a walk in the park, either. I have no particular insight into where this will go or which vision of the future will prevail. But I hope (perhaps forlornly) that it will be resolved through the actions of professionals acting in good faith and that neither side will resort to “dirty tricks”. I have argued for some time that the world of “blockchains” is actually two worlds: the permissionless world of “bitcoin-like systems” and the permissioned world of “ripple-like systems”. The reason we so often talk about them together is because they share a common architecture: the “replicated, shared ledger”. But they solve very different problems. 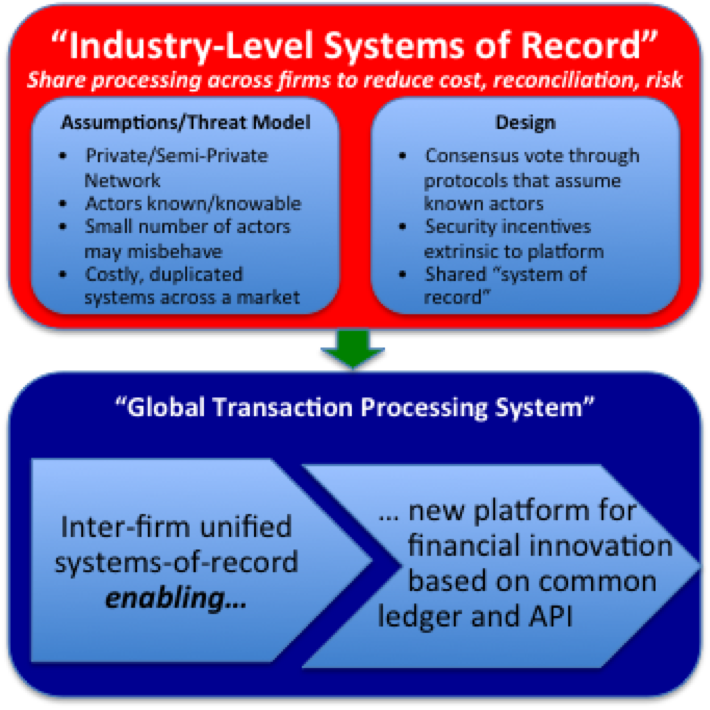 Tim Swanson has written about the permissioned-ledger world and my last post gave an argument for why banks, in particular, should be paying close attention to them. But this observation can be dangerous if people believe they are building a “blockchain strategy” for their firms when they are actually focusing only on the permissioned world. @mikejcasey are they using Bitcoin-inspired blockchain technology or "the" blockchain? I have no inside information into this project. But it should give pause to any who had dismissed bitcoin-based platforms as being irrelevant to finance use-cases. Forget Bitcoin at your peril? 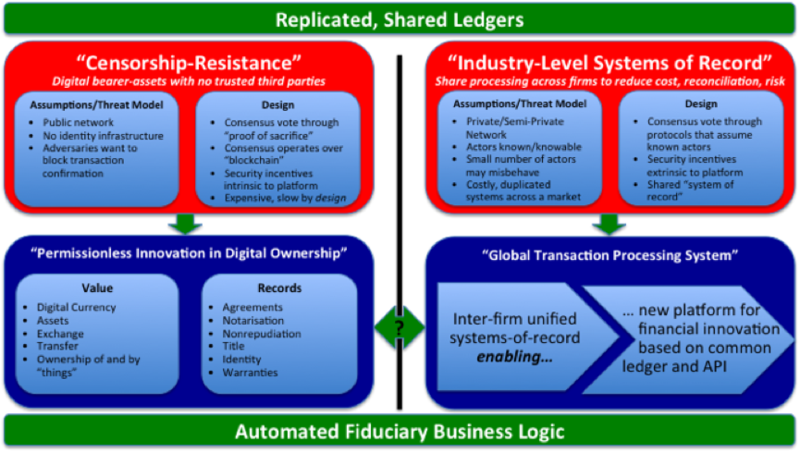 As I argued in my last post, the world of permissioned ledgers is pretty easy to think about: if you’re in a market where multiple firms in the industry are all building and maintaining undifferentiated systems that do pretty much the same thing – and they have to be reconciled with each other – then it can make sense to replace them with a single system that you all share. But if you’re concerned about having a single central operator then these new blockchain technologies give you an option that didn’t previously exist: you can implement the common infrastructure on a replicated, shared platform that you all help secure/maintain and so mutualise the effort of maintenance rather than delegating it to a separate entity. But, all too often, the analysis starts and ends there and disregards the “bitcoin-like” world. To see why this could be dangerous, we need to go back to the beginning. Those nine words seem innocuous but they have profound implications and explain why so many people still steer quite clear of it. The key is “electronic cash”. What can you do with cash that you’d need to emulate in an electronic version? First, cash is a bearer asset. The only way somebody can take away the money in my pocket is by confiscating it from me. Nobody in a central bank can “delete” my cash whilst leaving everybody else’s untouched. There’s a phrase for this set of requirements: censorship resistance. A true system of digital cash can only work if it is censorship resistant. And Bitcoin’s architecture does a pretty good job of achieving this through a very novel architecture. I sketch out some of the details for interested readers at the end of this article. Censorship resistance is not an objective that is shared by most governments, regulators, banks or most individuals! No wonder there is so much controversy around the system. Perhaps it’s just easier for respectable firms to steer well clear. And it gets worse when one observes that Bitcoin is worse than existing digital money in pretty much every significant way! It’s slower, it’s more expensive to operate, its value jumps all over the place and it’s really hard for consumers to use safely. So ignoring it is perfectly understandable. But it could also be a mistake. 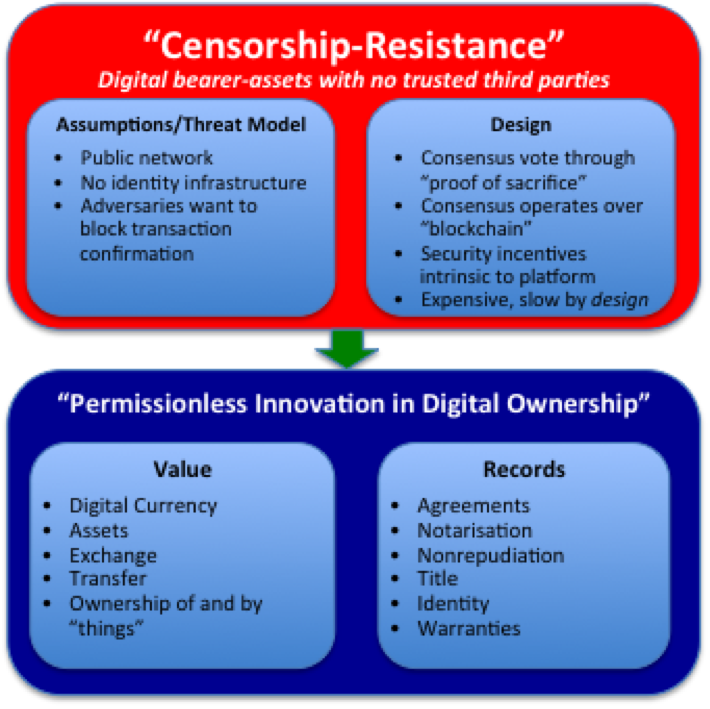 Because it turns out that censorship-resistance implies an even more interesting property: permissionless innovation. 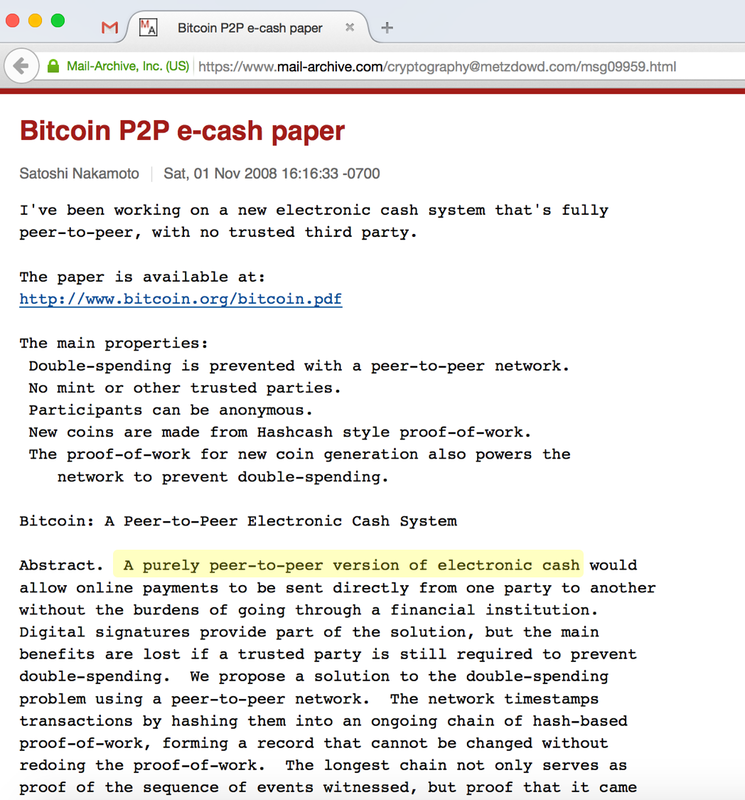 Think back to the design goal for the bitcoin system: electronic cash. And how that implied a need for a censorship-resistant bearer asset. These scary properties from a regulatory and banking perspective imply some very interesting properties from a technical perspective: this is the world’s first asset that can be held by anybody or anything and transferred to anybody or anything without needing permission. How do you do KYC on a fridge? Do you really want your washing machine having your credit card details on file? Perhaps the future of machine-to-machine payments is one where the machines hold their own assets on an open system. Sure: you could build a permissioned payments system for device-to-device payments but the simplicity and open-access nature of Bitcoin could mean that it’s just easier to do it that way. We often make the mistake of viewing this space through the eyes of incumbents. It can be useful to put ourselves in the shoes of others. For example, imagine you’re building a business for which getting a bank account and payment processing services would be difficult. Maybe you plan to operate in tens of countries. Or perhaps payments are a secondary concern for one of your use-cases… you just need a quick and easy way to make and receive payments. Sure… you could go through the process of getting a merchant account, signing up with a payment processor, proving compliance with various security standards. Or you could just use something with no barrier to adoption: bitcoin may have lots of problems but at least you can be up and running in seconds. Perhaps the most interesting future scenario is one where bitcoin isn’t used for payments at all. Instead, the security and censorship-resistance of its platform is seen as having value in and of itself – perhaps for notary services in the first instance – recording facts about the outside world – and so Bitcoin becomes nothing more than the token you need to own in order to purchase the services of the network. It becomes an app-coin, if you like. I accept that none of these use-cases is particularly compelling as I write this piece. There are lots of great counterarguments for all of them. But that’s partly the point: if any of these were obvious, nobody would be dismissing it. And this is why I find the Nasdaq example so interesting. Using the inherent security and open-access of the Bitcoin system to “carry” representations of real-world assets – “colored coins” – is an old idea*. And it also fits into my “second-order use case” category above. Now, Tim Swanson and others have written convincingly about many theoretical issues with the idea but we now have a brand-name firm experimenting for real and we’ll hopefully all learn from the exercise in time. So, sure: bitcoin raises all kinds of conceptual, legal, technical and philosophical questions. But it would only take one of these scenarios to drive some adoption and, very quickly, bitcoin might cease to be a sideshow. And, given that its core design goal of censorship-resistant digital cash has such disruptive potential – good and bad, this possibility alone is reason to keep an eye on it. Dismissing it entirely could be a big mistake. Note: you don’t need to read this section to understand the main argument of this piece. First, you simply can’t have the concept of an issuer in such a system: the issuer could selectively choose to honour only certain claims. So, if you can’t have an issuer of the currency on such a platform, it will have to be native to the platform. Hence Bitcoin as the currency unit and the interminable debates about why it has value and what that value should be, if anything. If you want true electronic cash, the processors will need to be paid in the currency of that platform. The breakthrough of bitcoin was figuring out how to put these building blocks together: how to ensure sufficient scarcity of the currency unit? How to keep the multiple ledgers synchronized? How to ensure the processors’ incentives are aligned with those of the users of the system? And so on. Of course, this isn’t the only way to think about the system. If you’re still interested, here’s my attempt to explain how it works by imagining how you could invent digital cash using an email system. I was a guest of the Financial Services Club Scotland last week. I presented an update on the world of cryptocurrencies to an engaged and well-informed audience in the library of the Royal College of Physicians. I reprised my current theme that the world of “blockchains” is really two distinct worlds – the world of Ripple-like ledgers and the world of Bitcoin-like systems – that happen to be united by a common architecture, the Replicated, Shared Ledger. This unifying concept is based on the idea that each participant has their own copy of the entire ledger – and they trust the “system” – whatever system that is – to ensure their copy is kept in sync with everybody else’s. The differences are about what the ledger records and how it is secured. Broadly speaking, Ripple-like systems are focused on the representation of “off-system” assets and are secured by identifiable entities. Systems like Ripple, Hyperledger and Eris are broadly in this world, I think. The security model of these systems is based on knowing who the actors are: if somebody misbehaves, we can punish them because we know who they are! Bitcoin-like systems are more focused on “on-system” assets and are secured by an anonymous pool of actors. Bitcoin and Ethereum are broadly in this space, I think. The security model here is based more on game-theoretic analyses of incentive structures: the goal is to make it overwhelmingly in the actors’ financial interests to do the “right” thing. There is, of course, some ambiguity since all platforms have some notion of “smart contracts” – or otherwise recording real-world agreements, as well as asset ownership. But this makes intuitive sense. If your platform is concerned with real-world assets and agreements then you necessarily need some concept of identity (who are the issuers?). And if you’re reliant on the performance of real-world actors, why not also rely on them for the overall system security? Likewise, if the whole purpose of your platform is to create and manage a new asset that can be controlled/subverted by nobody, then giving identifiable entities the power to control your security would seem to defeat the point! Different design goals, different implementations. And the value of such systems to banks, corporations or individuals is, ultimately, an empirical question. I imagine 2015 will be the year where we discover many of the answers. But I went further in my talk. I observed that these two worlds also differ in one other respect: the Bitcoin-like systems could be disruptive to existing institutions if they gained widespread adoption, whereas Ripple-like systems seem, to me, to be far more closely aligned to how things work today and are, perhaps, a source of incremental innovation. And to answer the last question, one must be sure to really understand what the system under analysis really is! For me, it is a mistake to think about Bitcoin solely as a currency. Because the Bitcoin currency system is a masterclass in mirage: underneath the hood, it’s a fascinating smart contract platform. Or, as I said at the Financial Services Club, every time you make a Bitcoin payment, you’re actually asking over 6000 computers around the world to run a small computer program for you… and your only task is to make sure that the computer program returns “TRUE”. Within the Bitcoin community, this is well-known, of course. Indeed, the work done by Mike Hearn and others to document the platform’s capabilities has been around for years. But I find most people in the broader debate are unaware that the platform is pretty much built on this capability – it’s not an add-on. I wrote a piece last year offering an intuition for how Bitcoin works, in terms of land. My point was that the fundamental building block of the system is the “unspent transaction output”, or UTXO. The UTXO is what you get when somebody “pays” you some Bitcoin. The “output” of their transaction is the money they paid to you. And whilst it sits in your “wallet”, it is, obviously, unspent. Hence “unspent transaction output”. Every payment that has not itself been spent is modeled in the Bitcoin system as an “unspent transaction output”. In general, each UTXO can only be spent by the owner of the “address” to which it was sent (not always, and this is the point; see later). And each UTXO has an identifier (the transaction it appeared in and its position in the list of outputs of that transaction) and a value: how many Bitcoins are represented by that UTXO. If you can make the program return “TRUE”, you get to say what happens to the funds. If you can’t, then you don’t. Your wallet software writes a little computer program for you and then sends it into the bitcoin network. It effectively says to the network: “Please run this little program I’ve just given you. Then please find a program (“smart contract”?) on the platform with this ID for me. When you’ve done that, feed the output from my program into program you just located”. So this is a two step process: you provide your own little program… and the output of that is fed to the UTXO program that you want to spend. So what are these little programs? In the common case, they’re really simple. The “UTXO program” simply says: “provide me with a digital signature that proves you own the key associated with the following Bitcoin address (and please also prove that you know the public key that corresponds to the bitcoin address)”. That’s why it’s called the “scriptPubKey”. If you don’t know the private key then you can’t generate the right signature and so you can’t create the input necessary to get the smart contract (scriptPubKey) to run successfully and you don’t get to spend the funds. So this, seemingly complex model, is just a way to ensure that the only person who can spend money at address 1abcde… is the person who knows the private key… exactly as we would want. Why is it this complex? But notice how powerful this is… because the other thing you do is tell the system to replace the existing scriptPubKey program with one or more new programs. And this is how your payment is modelled in the system. You pay somebody by creating a new program (a new scriptPubKey) that only they will be able to execute successfully. In this way, you can pay different people or send change back to yourself. The program that only you can run is replaced with ones that only the payees can run. And, in this way, the value has been passed from you to them. Paying somebody in Bitcoin is the same as replacing the program you control with ones they control. In this diagram, the funds you controlled have now been split between two new recipients. Only they can spend those funds. So what does this have to do with smart contracts? The key is that the model I outlined above is quite generic. The programming language is (just about) powerful enough to implement some interesting business logic that goes beyond “Richard paying money to Bob”. For example, you can write a program that will only return “TRUE” if you provide proof that you know the private key to multiple bitcoin addresses. This is a way to model “a majority of Board Directors must jointly sign before these funds can be spent”, perhaps. The Bitcoin “contracts” wiki page goes into far more depth. However, the reality is that the capabilities of the platform are actually quite constrained – and I think this explains a lot of the interest in other platforms, such as Ethereum. However, it should be noted that Gavin Andresen has argued that Bitcoin’s limitations need not be a constraint. Some might argue that it’s not necessary to think about Bitcoin in this way. But I think that would be a mistake. Because, while lots of people are getting excited about the potential of smart contracts for business, we’ve had a sophisticated smart contract platform running quite successfully for over half a decade, in the form of the Bitcoin network. Sure – it’s very limited (that’s why systems like Ethereum are getting built). But it might be a mistake to bet that it won’t evolve. First, FedCoin would be issued by the central bank. That contrasts with most other digital cash systems, where the holder has a claim against a telecoms firm or a commercial bank. In those systems, you have to trust the central bank not to inflate away the currency (as you do here) but you also have to trust the commercial issuer not to go bust – or any deposit insurance scheme to bail you out if they do. A central bank digital asset doesn’t have that second issue. Secondly, Aldolfatto suggests this currency could be issued on a distributed ledger. As he writes in an update to that post, many people have questioned why that might be necessary. Surely if you trust the fed enough to hold its currency, you trust it to run an accounting system! However, I wouldn’t dismiss this suggestion just yet, as I’ll argue below. Robert Sams has an intelligent and thoughtful analysis of the overall idea. 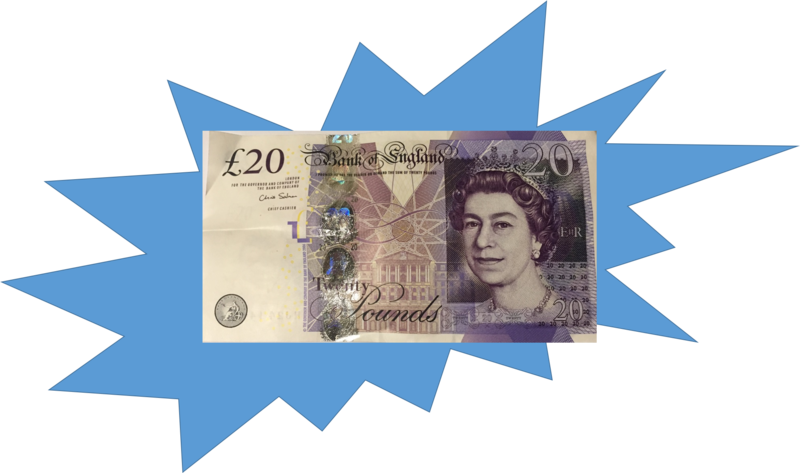 It’s not just the US: what about the Bank of England? No sooner had the FedCoin idea been discussed and dissected, the Bank of England published its 2015 “Research Agenda”: a paper summarizing all the questions they plan to examine this year. Turn to page 31 and guess what… there’s a section on Digital Currencies. If you haven’t read it, I urge you to do so. Because it doesn’t say what one might expect it to. Most official papers on “digital currencies” are influenced by Bitcoin and talk about volatility, monetary questions, the tedious question of whether cryptocurrencies pass the “money test”, regulation and so forth. This paper doesn’t. Instead, it follows the same line of reasoning as Andolfatto and focuses directly on the question of what a central bank-issued digital currency might mean. And the paper does something really valuable: it lists a set of questions that anybody planning to do something in this space would have to answer. And these are important questions. Imagine something like FedCoin was built and you were able to hold a digital asset that represented a claim on the Bank of England or the Federal Reserve. The implications for commercial banks could be huge: why would you lend your money to (aka “deposit with”) a retail bank if you could hold the same money in a counterparty-risk-free form? Do you need need most payment systems in a world with only FedCoin…? There’s more… Do we really want people having access to unlimited amounts of digital bearer assets denominated in GBP or USD? 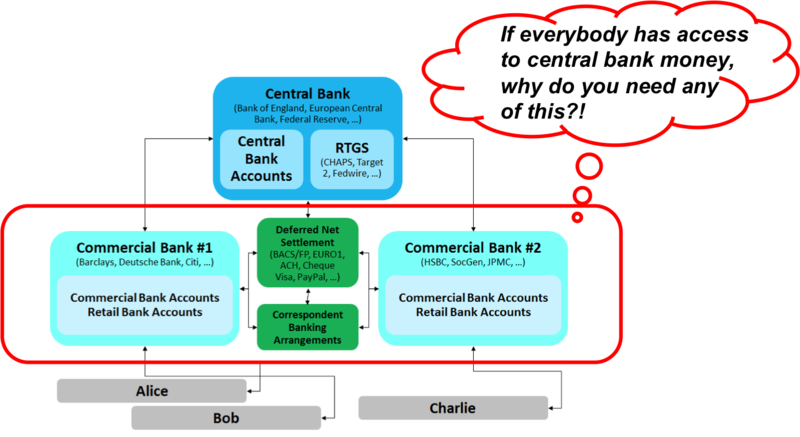 Do central banks have the culture, systems and experience to oversee such a scheme and spot misuse, fraud and crime? So perhaps a hybrid implementation, would emerge where consumers have to nominate a “sponsoring” commercial bank, which provides safekeeping services, has oversight responsibilities and, perhaps, has the ability to block suspicious transactions? Who knows. And I should stress that I don’t think anybody is proposing a system like this in any case…. These are research questions. But it suggests that the BOE questions are a very good starting point for thinking about these issues. But there’s a small issue: this intellectual exercise is fascinating but is a central bank digital currency actually needed? With a few notable exceptions, depositors don’t tend to lose their deposits when commercial banks fail. (But businesses and other large depositors often do…) And aren’t capital rules and prudential supervision designed to solve that problem in any case? Think back to the Andolfatto piece. He mused about building “FedCoin” on a distributed ledger. On its face, that doesn’t seem to make much sense. Implicit in my definition was that these “assets” could be native assets to the ledger (e.g. Bitcoin). But , more likely, they would be representations of real-world assets: GBP tokens issued by Barclays or HSBC or Coop, say. For example, you could imagine consumers paying £50 a month into a “mobile phone insurance smart contract” and, if they can provide proof that they’ve lost their mobile phone, the smart contract will pay out enough money to replace the phone, using the funds that have been paid in by all the policyholders. Perhaps the “proof” would be in the form of a “proof of purchase”, signed by a retailer and an “attestation of loss”, cosigned by the policy holder and a police officer. The details here don’t matter too much. But what does matter is the payment. How would you write a contract like this so that it could be sold to as many consumers as possible? They probably have accounts with different banks and, if we imagine a world of distributed ledgers, they’d all be holding different tokens: GBP-Barclays, GBP-Coop and so on. Which tokens should an insurance contract accept from its customers? Only tokens issued by “safe” banks? Which ones? Who controls the list? What about a £1000 IOU from me? Would the smart contract accept that? What about a £1000 IOU from a billionaire? What happens when the contract pays out? 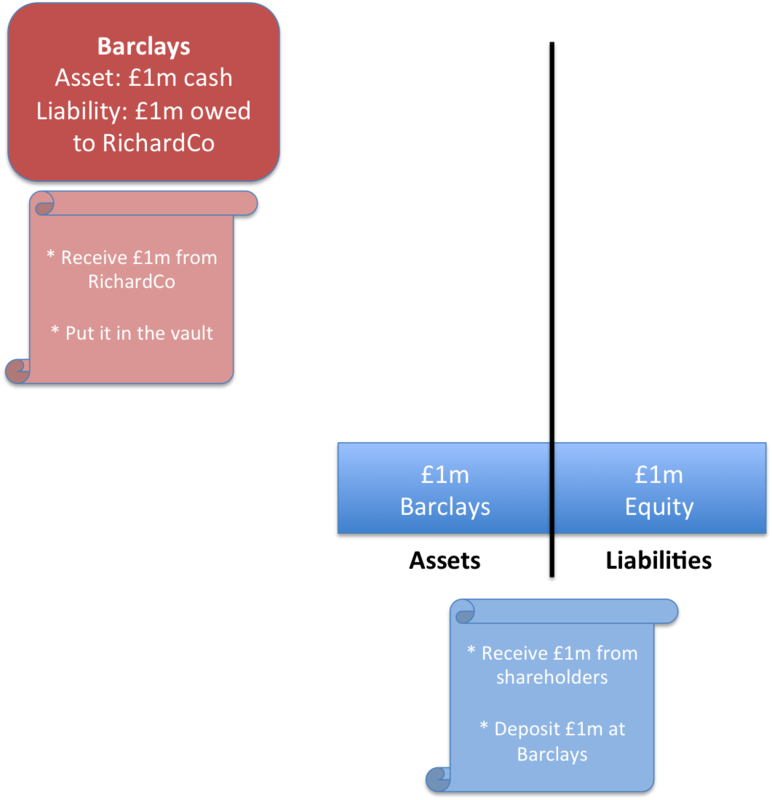 If you had paid in GBP-Barclays, how would you feel about receiving an arbitrary mix of GBP assets when you made a claim, based on whatever happened to be in the pool at the time? Systems like Ripple solve this problem by explicitly modeling the idea of an asset and its issuer. 50 GBP-Barclays is different to 50 GBP-HSBC and Ripple is built on that insight. So you could certainly configure the contract to trust some issuers but not others. But it gets complicated. What happens if one of those issuers gets taken over? Goes bust? Who updates the list of “trusted” issuers in the smart contract? And now, scale the problem up to the institutional side of the world, where the sums involved in derivatives contracts are enormous. Suddenly the identity of the issuer really matters. And this is where I think a central bank digital currency could make sense on a distributed ledger. It would clear away all that complexity. You could simply write the contract to demand payment in the central bank token. Policyholders would have the responsibility of converting other GBP assets into the central bank issued asset. Now, perhaps this wouldn’t be a problem in real life – maybe you could just write the smart contract to only accept GBP-Barclays, say, and insist customers of other banks convert into Barclays tokens in order to use the contract. But having a counterparty-risk-free representation of fiat currencies on these smart contract systems feels like it could be extremely useful. But time will tell, as always. Cost? Trust? Something else? What’s the killer-app for Block Chain Technology? Could decentralized ledgers change the face of accounting? When I speak to people about decentralised ledgers, some of them are interested in the “distributed trust” aspects of the technology. But, more often, they bring up the question of cost. This confused me at first. Think back to where this all started: with Bitcoin. Bitcoin is deliberately less efficient than a centralized ledger! Its design adds really difficult engineering constraints to what we already had. How could this technology possibly be cheaper than what we already have? And yet the claims keep coming. So perhaps this “cost” claim deserves closer consideration. Perhaps there are some scenarios where the “cost” camp might be right? So much comment in this space talks about “distributed ledgers” or “decentralized ledgers”. But there is very little reflection on what we actually mean by “ledger”. A company’s main accounting records. A general ledger is a complete record of financial transactions over the life of a company. The ledger holds account information that is needed to prepare financial statements, and includes accounts for assets, liabilities, owners’ equity, revenues and expenses. There are some key points here: “complete record of financial transactions”… “information that is needed to prepare financial statements”. I find this a useful definition because it captures two insights that will become important. first, we use ledgers to record facts… things that the company has done, transactions it has entered in to. second, the ledger is not an end-product; rather, it’s something from which we prepare other documents – our balance sheet, for example. So let’s work through an example of a balance sheet to test the “cost” argument. Imagine you had a fetish for being regulated and decided to start your own TINY investment bank. You persuaded your friends and family to invest £1m and opened the company. 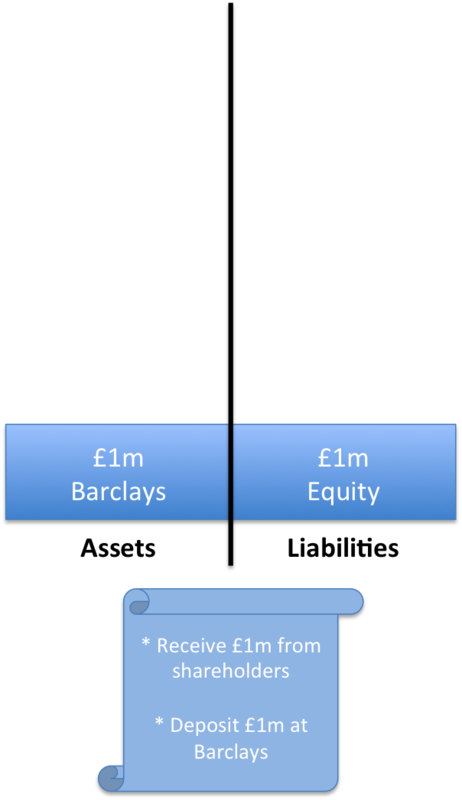 You haven’t started trading yet so your accounts are really simple: you have put the £1m you raised in the bank (let’s say Barclays) and, since your friends and family own the firm, you also have £1m of equity – which represents their ownership of the firm. Let’s call it RichardCo. 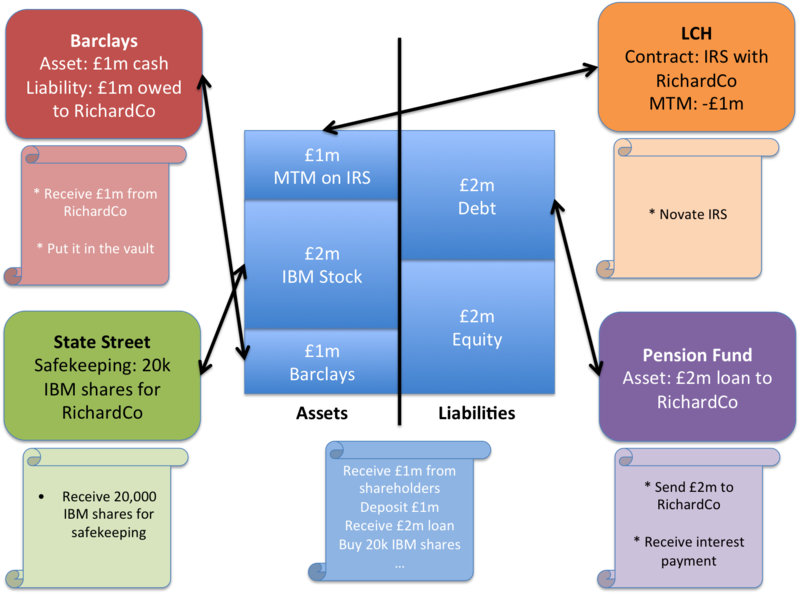 Hang On – What’s a Balance Sheet? What are all the things you owned at that point (your assets)? And what are all the things you owe (your liabilities?). If the difference is positive, great: this is your shareholders’ equity in the business. If it’s negative, it’s game over: you’re insolvent. RichardCo’s simple balance sheet. There’s £1m in the bank and you record your shareholders’ funds on the liability side of the balance sheet. The “scroll” is the ledger. By convention, we put the assets (the things you own) on the left and the liabilities (the things you owe) on the right. And we’ve captured a couple of likely entries from various ledgers that explain where the entries on the balance sheet came from. Notice how we put the shareholders’ funds (the equity) on the “liabilities” side of the balance sheet. This is because the shareholders’ funds can be thought of as a “residual claim” on the company. If you shut it down (or were shut down), you’d have to sell the assets, use the proceeds to pay off everybody you owed money to and, whatever was left, would be the shareholders’. You’d be liable to pay it to them. So we think of the equity as a liability. Now think about it from the bank’s perspective. They will also have a record. After all, they took it in as a deposit. So it will also appear on their balance sheet – but this time as a liability. They owe it to you. Your £1m asset in the bank also appears on the bank’s balance sheet, as a liability. Great – this is as it should be and it makes it possible for us to keep an eye on things. When it’s time to get your accounts audited, the auditor doesn’t just have to trust your ledgers. They can phone up the bank and get them to verify that their recording of the position matches yours. The fact you know this can happen acts as a disincentive to cheat in the first place. But, in reality, it’s far more complex than this. So let’s imagine you have gone to some pension funds and borrowed £2m – you want to be prudent for now. 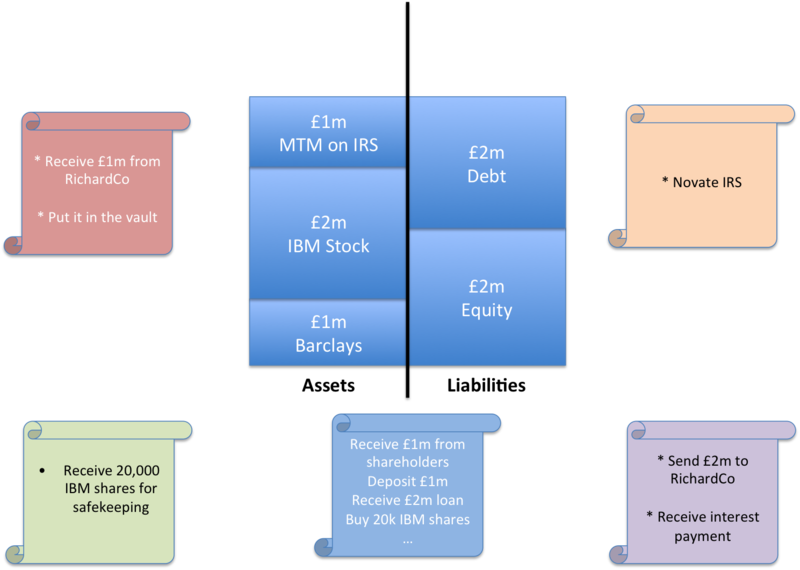 Youou decide to build out your broker-dealer arm first so you use the money you borrowed to buy some shares for inventory: £2m of IBM stock. That gets you about 20,000 shares, which you deposit at a custodian bank for safekeeping. Let’s also imagine that you enter into some interest rate swaps with some other banks. Perhaps LCH.Clearnet, acts as central counterparty for all these trades. And, brilliant news! Your derivatives positions have moved in your favour and it looks like you’re up £1m on them! Great. So your balance sheet now looks like this. 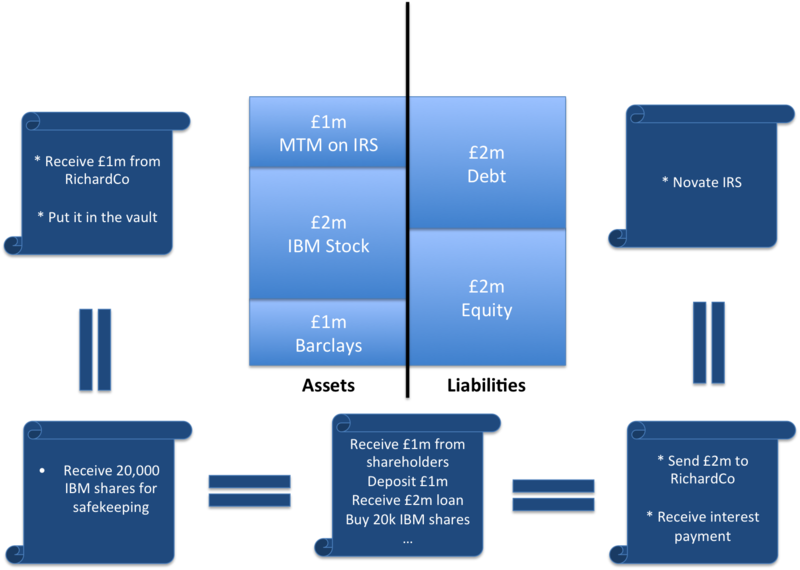 Your balance sheet after borrowing £2m, entering into some derivatives contracts that move in your favour (£1m mark-to-market – MTM) and buying some IBM shares. Notice how Shareholders’ Funds (equity) has increased by £1m as your assets (the money owed to you by LCH) have increased in value, whilst your debt has stayed the same. For every position on your ledgers that goes into creating this balance sheet, at least one other entity will also have a ledger that records the same position (from their perspective). Your (still very simple!) balance sheet will be reflected on ledgers and balance sheets all across the financial system. And this picture isn’t the full story. Remember we said the clearing house stepped in and became your counterparty? So the other participants will, in turn, have their own ledgers on the other side of the clearing house. And your shareholders presumably have their own records. And so on. One of the many important control functions in a bank is to check regularly that all these ledgers line up – that your counterparties agree with you on what it is that each of you own or owe to each other. But, interestingly, you only really need to agree your positions – not the valuations. You could, quite legitimately, come to different conclusions about the value of some positions. For example, let’s imagine that the pension fund thinks there’s a chance you’ll default on your loan. They will still have a record that you borrowed £2m but they may only value the position on their balance sheet as a £1.9m asset. Similarly, the fact of your derivatives positions is recorded on your (and LCH’s) ledgers. And you’ve probably agreed to pay (or receive) whatever cashflows their systems calculate. But how you value your overall position on the balance sheet could depend on a whole other set of factors. In principle, we need to reconcile our ledgers to keep everybody accurate and honest. But it’s perfectly OK for the subjective valuations of some of the positions (as reflected on the balance sheets) to be different – such as with the pension fund here. 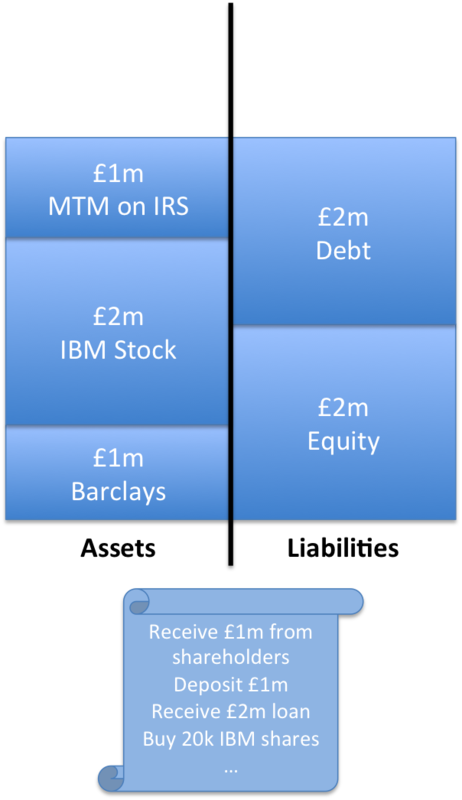 The same picture as before but with the other firms’ balance sheets removed for clarity. Our problem is to make sure these ledgers always agree with each other when they record information about the same transactions. So we see in the picture above that the facts that underpin my view of the world need occasionally to be checked against at least four other ledgers in other organisations and, in reality, many more. So now let’s turn attention back to the world of decentralized consensus. I said earlier that it’s hard to argue a decentralised ledger system like Bitcoin that replicates ledger data thousands of times can be more efficient. But perhaps it (or something like it) can. Imagine we’re living five or ten years in the future. Perhaps we have a securities block chain that records ownership of all securities in the world. 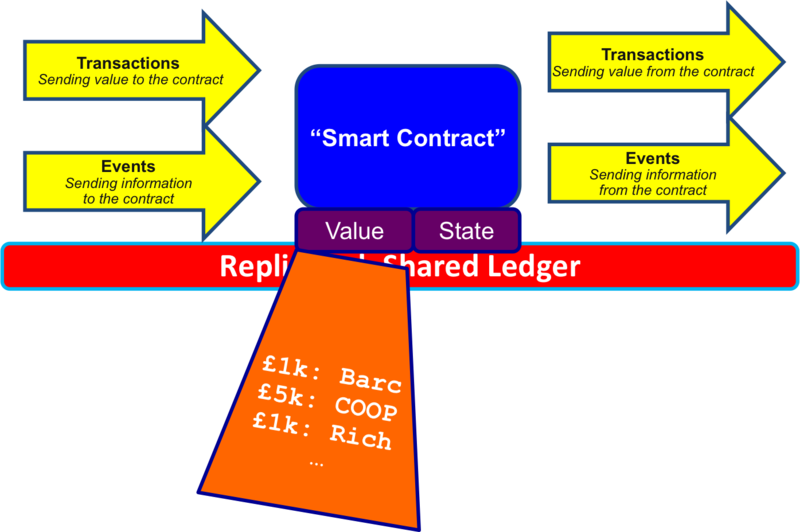 Perhaps we have a derivatives smart contract platform that records (and enforces?) all derivatives contracts? Maybe, even, there will be a single, universal platform of this sort. If so, perhaps all participants would have a full copy of this ledger. And so now maybe we can redraw the picture. A possible future: all firms record their external obligations and claims on a single shared, massively replicated ledger. Would this reduce (remove?) the need for systems duplication and reconciliation? Sure – everybody still has a copy of the data locally… but the consensus system ensures that we know the local copy is the same as the copy everywhere else because it is the shared consensus system that is maintaining the ledger. And so we know we’re producing our financial statements using the same facts as all the other participants in the industry. Does this mean we no longer need audit? No longer need reconciliations? Obviously not, but perhaps this approach is what is driving some of the interest in this space? But notice: this is just a way of ensuring we agree on the facts: who owns what? Who has agreed to what? We can still run our own valuation algorithms over the top and we could even forward the results to the regulator (who could also, of course, have a copy of the ledger) so they can identify situations where two parties have very different valuations for the same position, which is probably a sign of trouble. Security – imagine what would happen if somebody managed to subvert the ledger. This also has implications for who controls it, runs it and is allowed to connect to it. Bitcoin’s pseudonymous consensus system is unlikely to be appropriate here? Privacy – do you really want everybody being able to see all your positions? So I’m really not saying this is how things will pan out but I think it’s a useful thought experiment: it shows a potential use for replicated ledgers that might have utility but which doesn’t depend on being “trust-free” or “censorship-resistant”. Perhaps this is what some of the other commentators in this space have in mind?